In 1965 Van den Broek and Bakema presented their visionary Pampus plan for a new city of 350,000 souls on an artificial island in the IJ inlet. In a referendum held in 1997 the people of Amsterdam voted against plans to build housing in the IJ. But as the 21st century dawned, construction of the new residential district of IJburg went ahead all the same. Forty thousand inhabitants are being housed on seven artificial islands each with its own personality. 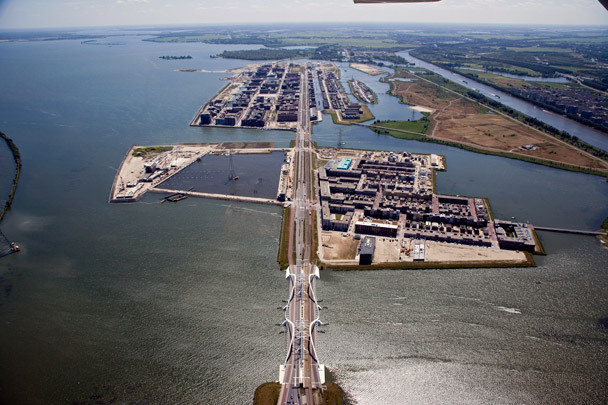 Haveneiland (harbour island), the first to be built, is premised on a rectangular grid of large city blocks to either side of the central axis, IJburglaan. This avenue is accessed from the mainland, also by tram, across Nicholas Grimshaw's bridge (Enneüs Heermabrug). Kleine Rieteiland (little reed island; Lisdoddelaan and surrounds) has private houses designed by individual architects. The more informal Steigereiland (jetty island; Jan Olphert Vaillantlaan, Cornelis Zillesenlaan and surrounds) also has private houses in a collage of terraces and single units as well as room for large numbers of floating homes. By now (2009), the above-named islands are largely complete. Middeneiland (middle island), Buiteneiland (outer island) and Strandeiland (beach island) are still waiting to be developed.